This is a close second option in a poll I conducted among my Patreon backers. Thanks to everyone who participated. The winning option, about branching and transfers, I covered last week. Modernizing commuter rail to run it like rapid transit means a lot of things. It means high all-day frequency, fare integration, good transfers to local transit (which requires fare integration), and ideally through-running in order to hit multiple business districts. In North America, these are absent, resulting in low ridership. So let’s posit that these problems are already being solved: commuter rail is being run frequently, the lines are electrified, the fares are the same as on local transit with free transfers. What should the stop pattern look like? This is not a purely hypothetical discussion, because in Toronto the under-construction RER system includes high off-peak frequency, electrification, and through-running, with fare integration under consideration. Metrolink and GO Transit have very wide stop spacing. 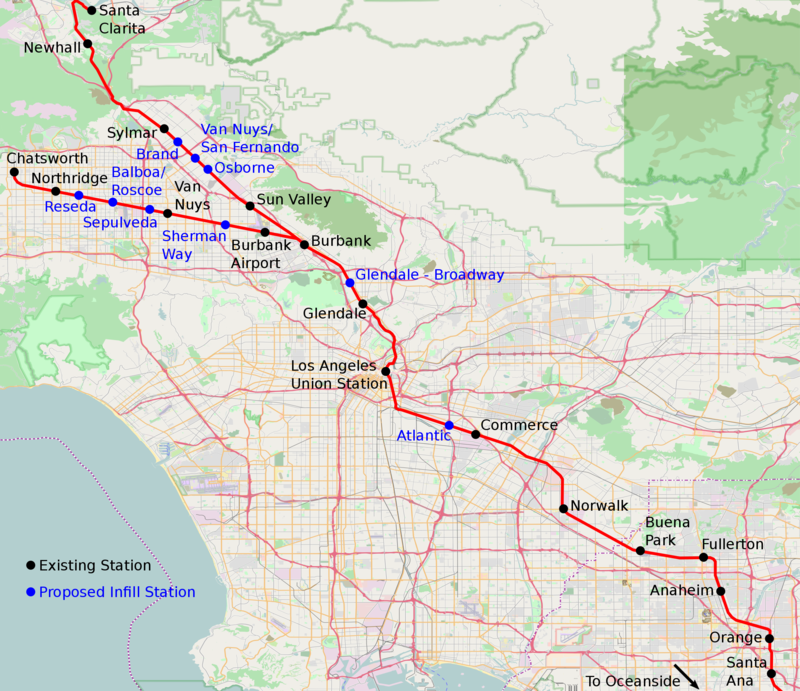 GO has straight track it owns outright on the Lakeshore lines, and Metrolink is straight with few curves on the Orange County Line (but freight owns much of the route) and straight until stop #4 on the Antelope Valley Line, Sylmar. EMUs could average 90 km/h on these lines, counting schedule padding. SEPTA and Metra have wide stop spacing in the core but very narrow spacing in the suburbs; I discussed this issue for Metra in an old post comparing its stop distribution through stop #12 with that of the RER. Metra Electric has a few inner stops, e.g. for the convention center (stop #4), but then there’s a 4-km gap from stop #5 to stop #6 (Kenwood). The downstream locations would still be very attractive infill train stations, with potential for high ridership. After all, they’d get fast service, too. If you get a 1-stop, 10-minute train ride to work, then adding four more stops to turn it into a 15-minute ride sounds like an imposition (it raises trip times by 50%), but it really isn’t, because most likely your actual commute is 30 minutes, with 10 minutes of walking at each end. With fare integration, buses should really be feeding the major train stations. Making every bus feed a small number of stations with fast commuter rail service compromises the rest of the network, whereas siting train stations at the intersections with the major grid buses in cities like Toronto, Chicago, and Los Angeles facilitates transfers better. I drew even more extensive (and somewhat fanciful) maps for Los Angeles and Chicago, with more infill, but I want to focus on my Electrolink map, because it showcases some caveats. Of note, there is much more infill on the Antelope Valley and Ventura County Lines than on the Orange County Line. This is because there is less residential density near the Orange County Line, and much more industrial land use. Los Angeles has a strong manufacturing sector, using the railroad for freight access, so residential upzoning near potential infill station locations is speculative. In the San Fernando Valley the land use near the railroads is not great, but there is a decent amount of residential density beyond the near-railroad industrial uses, there are strong bus corridors intersecting the railroads (and potential for light rail); the corridors also have less freight, so it’s easier to kick out industrial uses from station sites and do residential and commercial upzoning. In New York and Boston, there are other caveats, explaining why my various regional rail proposals for these cities call only for mild infill. The biggest caveat is that there exist parallel subway lines. Boston’s Old Colony trunk passes through relatively dense areas in Dorchester and Quincy, with just three stops: JFK/UMass at km-point 3.7, Quincy at km-point 12.7, Braintree at km-point 17.6. But the Red Line runs parallel to the trunk making more stops, enabling commuter rail to work as an express overlay. Thus, only the busiest locations deserve a commuter rail stop, and those are precisely the three existing stops. In Somerville, the Green Line Extension plays a similar role, providing local service that commuter rail would otherwise have to provide under any modernization scheme. As a result, my proposal for how to run the Old Colony Lines and the Lowell Line through Somerville is more intercity rail than local commuter rail. In contrast, the Worcester Line has no parallel subway except on the innermost few km, so it’s already getting two infill stops (Boston Landing and West Station) and I’ve called for several more. The same is true of the Fairmount Line, which is expanding from five stops including the endpoints to nine. There is an analog for this in Paris, on the RER. Within the city and La Defense, the RER A mostly runs as an express overlay for Metro Line 1, stopping at the major stations, omitting just Bastille, which is too close to Gare de Lyon. But the RER B really has two separate stop regimes. North of Chatelet, parallel to Line 4, it expresses to Gare du Nord, and then doesn’t stop again until reaching the suburbs. But south of Chatelet, all trains make 5 stops in 5 km to Cite-Universitaire, even ones that run express in the suburbs; this is the older part of the line, much of which predates the Metro, so Line 4 was built along a different alignment via Gare Montparnasse. Infill stops are more justified at intersections with major orthogonal bus or rail corridors or in dense, transit-deprived areas. Areas with little residential development are to be categorized based on redevelopment potential. Infill stops are less justified parallel to a subway line. The faster the subway is, the faster commuter rail should be. Infill stops are more justified on a shorter line than on a longer line. Here, “shorter” and “longer” do not mean the length of the line to the endpoint, but the length to the endpoint of local service, if the infill stops would not be served by express trains. In the Bronx the trunk line isn’t so close to the subway, but already makes multiple stops. There may be plausible infill in Morrisania between Melrose and Tremont. But even that is marginal – for one, Melrose, Tremont, and Fordham are all located at the intersections with high-ridership east-west bus routes, whereas nothing in between is. This distinction between an inner and outer part of the same line also holds for the Atlantic Branch: west of Broadway Junction it parallels the four-track A/C, so no infill is needed, but farther east it parallels the slower J/Z and isn’t even that close to the subway, so infill is useful. Going east, the LIRR Main Line is parallel to the Queens Boulevard Line, like the Lex a four-track line. There is no real point in infill, except at Sunnyside Junction, where the line meets the Northeast Corridor. The Port Washington Branch is a shorter line than anything on the Main Line, even the Hempstead Branch (but not by much), and isn’t as close to the 7 as the Main Line is to the Queens Boulevard Line; the 7 is also slower. This means an infill stop or two may be justified – my map has three (at Queens Boulevard, Broadway, and Junction), but that may be too much. It’s the west direction that is the most speculative, toward New Jersey. I have called for new Hudson tunnels to feature a station at Bergenline (building a station in the existing tunnels would disrupt current service and slow down express trains) based on the above principles. Additional infill is possible, but only subject to transit-oriented development plans alongside the line. The land use from just west of Bergen Hill, including Bergenline, to just east of Newark, is a combination of industrial warehouses and wetland preserves. The warehouses should be redeveloped, but until there is rezoning, it is pointless to add more stops. Moreover, Secaucus Junction is already in the middle of the warehouse area, so rezoning should start from there, and if the newly-built residential neighborhood grows big enough so as to justify a second station, a second station can be added later. The upshot is that even though New York has very wide stop spacing on commuter rail near the core, it does not need as much infill as Los Angeles or Chicago. What about Toronto, the original impetus for the post? There, Metrolinx is already considering minor infill. But if the principles emerging from how I think about infill in the US and on the RER are correct, Toronto needs far more infill. The Lakeshore lines are not really close to the subway: they run east-west, as does the Bloor-Danforth Line, but Lakeshore West is about 2 km from Bloor, and Lakeshore East is mostly 1 km from Danforth, with just a short segment within walking distance. The inner areas of Lakeshore West are very dense, with some blocks at 30,000 people per km^2, and only served by buses and slow mixed-traffic streetcars; even some areas along Lakeshore East are fairly dense, more than 10,000/km^2. Toronto’s bus and streetcar grid hits or can be extended to hit several potential station locations, offering better connections than riding to the Bloor-Danforth Line and then changing to Yonge to reach the CBD. The one drawback in Toronto: the commuter lines are very long. Not all trains have to make all stops, but if there’s one stopping pattern making 3 stops in 15 km and another making 12, then it isn’t really possible to mix them on the same tracks at high frequency. The core lines have four tracks, but Lakeshore needs to eventually mix four classes of trains: local commuter rail, longer-range commuter rail, intercity rail, freight. There are ways around four-way mixture (for example, there is little freight on Lakeshore in Toronto proper, where the local trains would run), and intercity trains can probably share tracks with long-range commuter trains. It’s solvable, just like the three-way track-sharing between local, express, and eventual high-speed trains around New York, but it isn’t trivial. In general, North American commuter trains make too few stops in the urban core. Tellingly, while I can come up with many examples of lines that require infill, I can’t name five good examples of anti-infill, where a station served by commuter trains full-time should be closed. But not all commuter lines are equally good candidates for infill stops, and there are large networks, such as Metro-North, where the current stop spacing is fine, just as there are ones, such as GO Transit and some Metra lines, where some inner segments could plausible see the number of stops quadruple. 3. Do you have any thoughts on consolidating closely-spaced stops in areas that are dense by suburban standards, but with single-family homes, such that there aren’t really tracts of land available for major TOD? The biggest examples in Philly that come to mind are the Wilmington Line between Darby and Chester as well as certain parts of the Paoli Line. 4. One thought I’ve had recently (again, in Philly) would be to add ~two stations on the Wilmington Line in Southwest Philly in order to connect to intersecting bus routes. But given that there are trolleys 1.5 blocks away on either side, it seems like overkill to provide that much service there. Also that’s a straightaway section of track that’s otherwise nice for getting a little speed in, even though it’s a crystal-clear example of the bad stop-spacing habit that you’ve discussed. 1. I do see such an argument. I just think that because the 4 and 5 exist, the argument isn’t too strong. The difficulty of building infill stations underground doesn’t help the case. If I had to add a stop on Metro-North for network connectivity, it would be at 53rd and not 59th. 59th gets you to the N/R/W, which go east toward Queensboro Plaza (served by the 7, albeit more slowly) and west and south toward Times Square (served by the shuttle). 2. That’s really hard, because of coherence problems – lines self-intersect. 3. Philly and Chicago both have this in the suburbs. Apparently each town needed a commuter rail station named after it, for marketing purposes. I’m not really comfortable with anti-infill in either. The SEPTA trains accelerate fast, and dwell times should be reduced with level boarding regardless of stop spacing. Another problem is that there isn’t really a big source of passengers that are being delayed by the Darby-Chester stops. There’s Wilmington, but it’s so far from Philly, and there’s so little potential for anti-infill upstream of Chester, that anti-infill downstream of Chester wouldn’t really save Wilmington-Philly riders much time relative to their overall travel time. Of course, if that stop spacing continued all the way from Chester to Wilmington then anti-infill (or express trains) would save a lot of time, but it doesn’t; the average interstation from Philly to Wilmington, 2.7 km, isn’t especially narrow. 4. The subway-surface lines are nice, but they’re not exactly high-speed. They do tilt Southwest Philly infill toward a wide stop spacing, more like 2 stations as you suggest rather than 4 or 5, but it should still be more than 0. The straightaway is nice, but the Silverliner V today loses around 75-80 seconds to a station stop. EMUs accelerate fast, even with the FRA weight penalty. The interlocking for Grand Central starts to fan out on 57th. plopping blocks of platforms centered on 53rd would foul things. If I remember correctly there are four tracks all the way to Wilmington. The local can toddle along on the local tracks while the DELDOT express to Wilmington and Newark sneaks it’s way in between the Amtrak trains on the express tracks. Otherwise, we have a couple infills along inner Paoli & Cynwyd lines in West Philly. It’s all precluded until changes in fare collection, pricing and frequency are made. Thanks, Alon. Assuming one could be built without equipping SEPTA trains with cog traction to get from the elevated former PRR to the trenched former Reading. The really tight curve would slow the trains down quite a lot. It’s not worth the minute or two it might save getting to Suburban. Would take SEPTA off of Amtrak rails between Zoo and Shore, which could add a lot of scheduling flexibility. I’m also assuming a stop at North Broad anyway, so the slow turn isn’t a problem. there are four tracks. if they want to they can keep the SEPTA trains on the local tracks and the Amtrak trains on the express track. Voila, solved your perceived scheduling headaches at a very low cost. I think the tunnel is a big unnecessary cost/complication. Better to keep the Trenton line on its current route without construction, and move the North Broad station (Reading lines) north of Lehigh Ave, so there is an easy transfer between Pennsy and Reading lines. A totally different idea that I had was to build a small tunnel west of the Ben Franklin Bridge, and route PATCO into the SEPTA tunnel as another regional rail line. Similarly, another couple New Jersey corridors (such as the current River Line) could be added as regional rail lines. Can the PATCO infrastructure handle mainline trains? I can’t find what the loading gauge is. One of the advantages of PATCO is that it is a subway, not a regional rail. Big cost advantages in that. I think the Trenton Line diversion has advantages for Amtrak, so can see the Feds picking up the tab. The Trenton Line has four tracks and no need for more than one regional rail stopping pattern. The NEC project is recommending http://www.necfuture.com the tunnel/trench approach to straightening the curve at Frankford http://bit.ly/1Siloyl, against the wishes of our author http://bit.ly/2aoCTK2 . Whatever. They will be spending big money to straighten that bend — surely the connection to the SEPTA Mainline would be chump change to make sure Amtrak gets the most out of this. There will never be SEPTA-AMTK separation on the Paoli or Wilmington lines, so Trenton line separation gives an important degree of freedom for both SEPTA and AMTK. If there’s Federal money available, we should take it. He’s got a North Broad Street station fetish, that the Trenton line is four tracks doesn’t seem to be sinking in. That’s an advantage in terms of headways. I suppose you could run regional rail to be equally frequent, though it does not seem likely that that would happen in practice. PATCO might also be cheaper than regional rail, but that is trivial to take care of. I don’t think this idea would improve the PATCO line over its current state, but it would improve the other two NJ corridors, so I suspect it would be a net gain. Platforms at 59th St exist, though they are only 150ft long (and have never been used). Also at 72nd and 86th. stopping 800 foot long trains at them wouldn’t be particularly effective. the platforms, in nice round numbers, would be four blocks long. at least, five might be better. The interlocking at each of the islands would take up space. Islands because this wouldn’t be worth building unless there was going to be thundering herds of suburbanites using it. East Side Access North in scale. perhaps only one level but that big. It would be very low on my list of priorities. If the point is to get suburbanites off the subway it would be much more effective to get the ones destined for the country’s third or fourth largest employment center, Wall Street, out of Midtown and the subway. zoom out and think about how it would be phased over 20 years. …almost everything is at or near capacity. Add a million people to the city, it needs at least another four tracks of subway. Zoom out and think big. …Penn Station access for Metro North is a stop gap… Think big. All the ideas involving using Metro North tracks as part of the Subway are sort of oblivious to Metro North being more or less at capacity just with its own riders. There’s of course some extra slack remaining like with bilevel commuter cars and maybe slightly longer trains, but really there is not much there due primarily to the Park Ave. Viaduct/Tunnel section being the main capacity chokepoint. Possibly that section could be expanded, although it might be better to just create another right of way from the Bronx, like using Madison or maybe 5th Ave. and build another 2 or 3 tracks under it, bypassing the issues involved with threading the needle to extend GCT tracks further south. Unless there’s a sacred Water Tunnel already under there, this ROW could stop at or near enough to Grand Central, go beyond, perhaps with a midway stop at Union or Washington Sq., then on down to the Holy Grail Trillion Dollar Great Crossroads SuperStation somewhere deep under the Financial District connecting this line with those to Atlantic/Flatbush in Brooklyn, to St. George in Staten Island and Hoboken/Jersey City across the Hudson. Now if there was some overall relief on the traffic side, like along with PSA, adding another 2 or 3 tracks through Manhattan to supplement the Park Ave Viaduct as above and the corresponding extra trackage in the Bronx, at least on the Hudson line along the Harlem River, but preferably also thru to the Harlem line/New Haven line split, then there might be some capacity to play with that could be used to support some sort of City Ticket Service. At this point, one might acquire some appropriate (i.e. more Subwayish equipment and run separate services at a Subway price point between GCT and Penn to Yonkers, Mount Vernon and New Rochelle along the various lines. The Bronx/Harlem River section of the Hudson Line, and as above the Bronx River portion of the Harlem/New Haven line could generate good ridership at that price point. When were the stations between GCT and 125th street abandoned? I realize they’re too short for modern trains, but there were several of them at one time, right? 59th St never opened, and 72nd St never saw more than one train a day, but 86th St and 110th St had hourly-ish service on trains to Williams Bridge from 1876 to 1903 or so (nobody seems to know the exact end date). See here for details. Supposedly, ridership collapsed after Third Avenue El opened, which charged lower fares and went all the way to Lower Manhattan (and was more frequent, but I don’t think it was as relevant then). That would make sense (and the Third Ave El opened only two years after the local Park Ave stops opened), but the NYCRR went to the trouble of rebuilding/raising the platforms at 110th St in 1897 during the project to raise clearances over the Harlem River (at the same time today’s 125th St station replaced the original open-cut station; see here), which suggests 110th St had worthwhile ridership well into the elevated era. 2. I have a crayon, but route pairings need to be decided. By pairing TRE/WTR train with the new South Jersey lines, you can avoid coherence problems. But it’s not thaaat big of an issue currently. 3-4. Glenolden and Norwood should be combined into a single stop over Chester Pike. Crum Lynne and Curtis Park should be flag stops. That’s about it really; otherwise access could be improved by adding a few stops in the Wilmington suburbs, like Newport and Edgemoor. Under current schedules, a train from Darby station is about 2x/15min faster than the equivalent trolley, so the potential for time savings is there. I envision stops at 70th, 63rd, and 54th. The current Airport Line Eastwick station should be replaced with one station at 89th and one at Island Ave, paired with the redevelopment of Eastwick and airport. Sounds a lot like the service that RTD is running in Denver! I have no idea where you got the stat that the first Paoli line station is 8.7 miles from the city center. Overbrook is about 4.5 miles west/northwest of 30th Street, and the subsequent stations are generally about a mile apart. Wikipedia says 5.4 miles, which is 8.7 km. If Toronto’s Lakeshore only has a few freight trains per day, then they should quarantine any freight movements to the off-peak and allow passenger trains only on all four tracks during rush hours. That leaves three different mixtures during the most crucial part of the day if they implement the pattern you suggest. I do wonder if extra stations are the right solution for parts of the corridor since the Downtown Relief Line will just run slightly north of the commuter rail corridor. Infill stations will be important for GO Transit but only beyond the subway, as you write, but I would also include the future Downtown Relief Line. They could reopen the Woodhaven stop at 98th street that was closed in the early 70s. Be nice to do that the same time they restore the Rockaway branch back into Penn or Grand Central. I’d think more carefully about infill stations between LAUS and Fullerton. First of all, all that industrial use employs a lot of people – in fact the current OC Line Commerce station exists almost solely to serve workers at a giant container marshalling yard on one side and a big USPS facility on the other (Commerce was created to be an area where industry could do whatever it liked, without pesky residents getting in the way, and to this day less than 13,000 people live there). Second, while I don’t know the overall exact numbers for the area, there’s plenty of housing right by the tracks that could be served by well chosen station locations. I suspect a bigger obstacle to your proposal simply be capacity between Redondo Junction and Fullerton. While BNSF is marginally less adamant about opposing electrification than UP is, this is part of the BNSF Southern Transcon and sees over 80 freight trains a day (in addition to about 20 Pacific Surfliner trains). Even if they four tracked the whole thing, that’s a lot of heavy freight to schedule frequent Metrolink Service around. I should say, the Commerce station also serves a BNSF maintenance facility and a number of other industrial concerns. There is no housing anywhere near it. Sounds like a good place to put an enormous park-n-ride. Where? There’s no open space. Also nobody’s building a big park and ride that close to downtown LA. You would also have to significantly expand the station, it’s just a single platform and only has service during shift changes and peak hours. @adirondacker – please explain your plan and how it would alleviate traffic in LA. I don’t have a plan, if it’s the industrial/commercial wasteland you say it it is, it’s a great place to park cars. No retail to disturb and no residents to displace. Which of those industrial properties gets to be torn down? Bear in mind, this isn’t the East Coast, those are all ongoing businesses that employ numerous people. Where are all the park and ride commuters coming from, and to what jobs are they commuting to? One other possible location would be a station between LAUS and Redondo Junction. It’s an ambition for that part of LA to get a Red/Purple Line Station, especially since LA’s main subway train yard is already there. That section of the line is also only very rarely used by freight trains, so there would be little concern about increasing congestion. I have a fantasy involving an infill stop connecting to the Expo-Eastside Gold Line after the Regional Connector opens. But, well, fantasy. The problems are that 1st street, where the gold line crosses, will be just south of the junction created by Link-US, so constructability seems iffy. Also, a location a few blocks south would better serve the Arts District. Alon, I realize this is an infill post, but I’m wandering now how you feel about South Coast, Cape Cod, Nashua, etc. extensions? Also, are you still on your original plan’s 15 minute headways for Fairmount and 15 minute headways for all of the Framingham/Worcester Line? To the topic of the post, I’m surprised that you didn’t have more infills for Hyde Park (Mount Hope) and South Salem infills. Also surprised about the Alewife infill. Some in Hyde Park will have really long walks to the Forest Hills, Cleary Sq., and Wolcott Sq. stops, or may have to take the 32 bus to one of those stations. At any rate, thanks much for the post. The Providence Line is two-track and shared with intercity trains, which limits the amount of infill it can support without wrecking the schedule. Forest Hills is fine, Readville is fine, Mount Hope is dicey if you want to mix in trains from the Stoughton Line (or from the Franklin Line, but those you can reroute via Fairmount, hence my other MBTA regional rail schedule map). I put in the extensions on the map because I wanted to see how well they work with the schedule. With the exception of Nashua, they make the schedule strictly harder (Nashua/Manchester makes it easier), in the sense of adding a little more than an even multiple of 15 minutes to the one-way trip time rather than a little less.